If we had the time for several lectures on business models, this would be a good book to use.
. I decided to open this unit with a quote from Machiavelli since it reminds us that the consideration of new business in a "challenging" environment is not just something we hadin the 1990's, it goes way way back. The quote from this philosopher also suggests that when it comes to business models, it is always difficult to be the one to go first - which is often what is happening in 2001, 2002, 2003 - many companies are the "first" to do something new. Going first can be very "uncertain" - but, it you succeed, it can also mean you have a head start on everyone else and it can be hard for the competition to catch up. "it is getting harder for companies to deliver profitable growth on a sustained basis. It is also more difficult for many companies to hold their ground and not fall behind. The key reasons include the dramatic increase in complexity in managing business and the increasing premium put on innovation. The complexity is due to significant and irreversible changes in the business environment. The pace of business is accelerating beyond the ability of most corporations to adjust. " Some even go so far as to say the goal is not to make money, but capture market share and the model is based on that assumption. The table below lists the names of each model discussed in each text - you can see, even the experts cannot agree on some simple commonalities for this topic; perhaps this is because the variations in e-business models are as varied as brick & mortar businesses !!! First, divide the list according to whether it is a physical product or a service - many services can be sold online and areunique to the Internet world, many of the products sold online simply use the Internet as another form of advertising and the "model" is not so special. The second thing to do is divide the list according to whether the product/service is for business2business purposes, or for consumers direct - the differences are huge. An online website listing plastic autoparts will require a completely different model than a website selling DVD movies to individual customers. Hanson says of revenue based models, "the major split is between cases where providers pay for service and those where users pay"
"firms act as market makers who bring buyrs and sellers together for a fee for the transactions they enable"
a company provides some attractive content to bring in browsers. 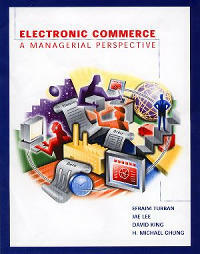 "The website owner usually makes money by charging advertisers fees for banners, permanent buttons and other ways.."
"a firm collects valuable information on consumers and their buying habits and sells it to firms which in turn mine it for important patterns and other useful information to help them better serve their customers"
"the e-tailer model in which wholesalers and retailers sell goods and services over the Internet"
"rests on community loyalty rather than traffic. Users have invested in developing relationships with other members of the community and are likely to visit the website frequently"
"Members pay a subscription price and in return receive high-quality content". In reality, this model has not been too successful in 2001 and 2002 due to many alternative sites providing similar content free using the Advertising model. The only way this model works is if the content is VERY VERY good and cannot be seen for free on other sites. "activities are metered and users pay for the services that they consume"
. In both their First Edition and their Second edition, Schneider and Perry have three chapters that are titled with the word "Strategy ..."
Schneider and Perry comment that this model was seen, in the early years to have great possibilities, but since then it has been "hampered by two major problems"
. Channel conflict and cannibalization are increasingly important for marketing students to understand in the context of an increasingly competitive marketplace employing so many new technologies. Additionally, there are retail conglomerates which are very desirable for manufacturers and vendors and there is developing intense competition for access to these. If you can't get into the major chains, you will not have the volume of sales to grow from a medium sized company to a large sized company. "Companies that have existing sales outlets and distribution networks often worry that their web sites will take away sales from those outlets"
. Tim Richardson cites the example of one Toronto store that bought Larkhill Lingerie, but then cut out all the labels that say www.larkhill.com and affixed a sticker with the website of the store.
. Virtual companies as a concept are not new, in fact they are very old - the only thing that is the use of the adjective "virtual" and the technology which facilitates communication among the corporate components. Virtual companies are essentially a special way that people provide capability to clients. Instead of having to possess all the capability that all your clients need all the time, virtual organizations consist of networks of affiliated people (specialists) and organizations which, depending on the project, will get together to provide a solution to a client which one of the people in the virtual network has. The reason this type of structure has become spoken off in the category of business models in the year 2000 is because it allows individuals and small sized organizations to bid on tasks that may be beyond the capability of the originating consultant - yet, can still be "handled" because the consultant has, through affiliations, friendships and alliances, a virtually larger capability which can be brought in to handle a larger situation. Virtual companies are not just contained to the IT business world but exist in many types of formats in business throughout the globe. 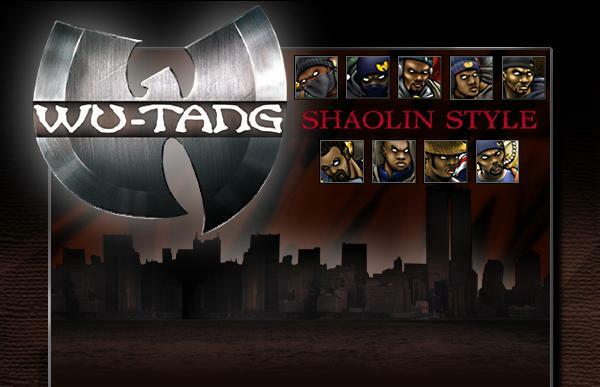 One example of the diversity in applying virtual companies as a concept is the famous rap group Wu-Tang Clan.
. The reason for mentioning Wu-Tang Clan is to prove, by example, that business is not just the circumstances of widgets and auto parts,- business is very diverse and the entertainment industry is definitely big business - with all the commensurate business considerations, such as business models. 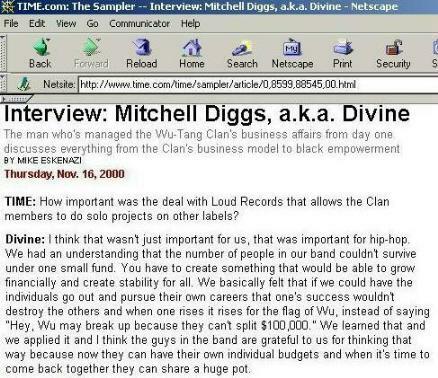 As TIME magazine noted, (Dec 11th issue, 2000) "The Wu-Tang "brand" blossomed in 1993. 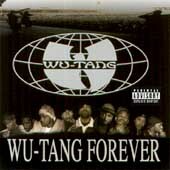 Each member of the group periodically goes off and does some solo project from which they develop additional capability and experience, at the same time keeping public their alliance and affiliation with Wu-Tang. The "brand", in the form of the bands members, continue to also put out products under the bands name as well in order to maintain the value of the "base" of their individual reps. The strength of the company, as explained in TIME, is "... maintaining just a small core and outsourcing everything else." for those of you that don't know much about the "business" of rap and hip hop, this is a fascinating interview which exposes just how "business" oriented these people are to market share, branding building, product diversification etc. Diggs "my original strategy — to have artists placed in different locations, then get those different labels to work together for my brand"
"Everything else" is their forays into video games, clothing, comics, movies and many other constantly new and evolving merchandise crossing over and back into music, video, movies and the internet. The author of this web page, [witiger] does not necessarily advocate or subscribe to the lyrics, imagery or lifestyle associated with Wu-Tang Clan, [which some may find objectionable] or any other musical group noted herein. The purpose of noting this organization is strictly in the context of exploring the great diversity of business activity which is online, and reflects the diversity of business globally. The entertainment industry is often the particular area of business that adopts new technologies for creating "content" and sharing "content", yet many traditional business academics still choose to use examples from consumer product companies when discussing new ideas. The author of this website chooses to explain examples a bit differently !
? "Is the cooperating model of Amazon and Ingram more ffective than the cyber book-retailing channel barnesandnoble.com with the traditional nationwide store network"
"which is better, a pure-play, or a click and mortar?". 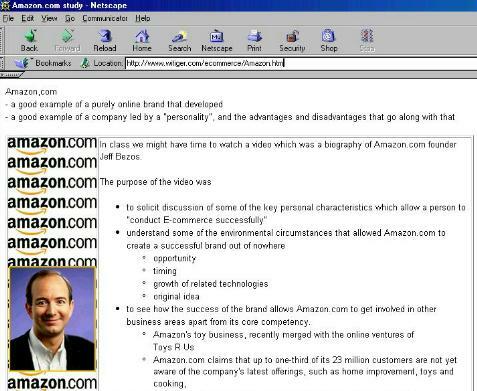 Additional information above and beyond the text reference to Amazon is linked below. "Patents on Internet Business Models"
Nicholas Schmidt's article March 2000 on the Cybersavvy website is good reading because it explains the consequences if patent protection becomes to extreme. 5.) Create a Web site that does any kind of e-commerce at all? ...unless you pay a hefty MONOPOLY PREMIUM because all competition in the Web software market has been virtually eliminated;"
. Schmidt's article may seem a bit sensationalistic but the concern is that the U.S. Patnet Office may grant Patents in situations where it would be againstthe best interests of future competition and good business practices for consumers and vendors. In the offline world, Patents are given only after a very rigorous process. For example; McDonald's make a lot of money from drive through service - but they cannot patent that since they could establish that they were first to do it, and it would be considered unenforceable since so many other businesses adopted that model for fast food retail. However in the online world, companies are seeking patents for particular process of payment execution, product information, web page layout etc. and they are trying to justify protection by claiming they are the originators of the concept. "What damage has been done? Amazon.com owns a patent on their "groundbreaking" idea of one-click ordering: This is the idea of placing a button on your Web site that allows ordering without entering credit card details every time you place the order. The USPTO should have said: DUH! Instead, they granted patent number 5,960,411 on 9/28/99. Now Amazon.com received a patent on "affiliate programs": The idea of issuing someone commissions as a reward for all sales that have been generated by a hyperlink from their site to yours. Again, anybody who ever created just one Web page would say: DUH! But the USPTO granted patent number 6,029,141 on 2/22/00. BOTH IDEAS ARE PLAIN AND OBVIOUS. But, due to a loophole in U.S. patent law, you, me, or anyone, could have applied for a "patent" on these business processes, so as to extort royalties, or impose a de-facto e-commerce tax on virtually all transactions made anywhere on the Web, from anyone in the world who ever chooses to create Web sites that employ the same, inevitable, and obvious IDEAS."
. A number of law firms are trying to substantiate themselves as being able to offer e-businesses protection for their idea - and of course billing out large fees for this advice. to consumers because it is built with cutting edge technology that provides advanced audio/visual user interfaces, services and security measures. E-commerce proprietors have recognized that a competitive advantage may be gained by securing patent protection for such technological innovations. Other times, the appeal of a Web site does not lie in cutting edge technology, but rather is due to an innovative business model. E-commerce proprietors may be surprised to learn that patent protection also may be available to protect innovative business models embodied in computer software." "unpatentable" subject matter include a mere idea, printed matter, an inoperable device, e.g., perpetual motion machine, and an obvious improvement of an old device. Typically, any arguable use for an invention will suffice to meet the usefulness requirement. To qualify for patent protection, an invention must be novel when compared to prior solutions to the problem solved by that invention, i.e., the prior art. Two broad categories of prior art which may destroy novelty include (1) events which occur prior to the date of invention and (2) events which occur more than one year prior to the filing date of a patent application directed to the invention. If an event satisfies either requirement, it is considered prior art. " . "A Business Model of One's Own"
"Can you actually patent a business model? A recent (1998) decision from the (U.S.) patent and trademark office says you can. And that isn't good news for entrepreneurs"